Perfectly cooked steaks, snappy jumbo shrimp, and juicy pork chops? Great cooks can do it every time, good cooks can do it most of the time, and most cooks can do it some of the time. 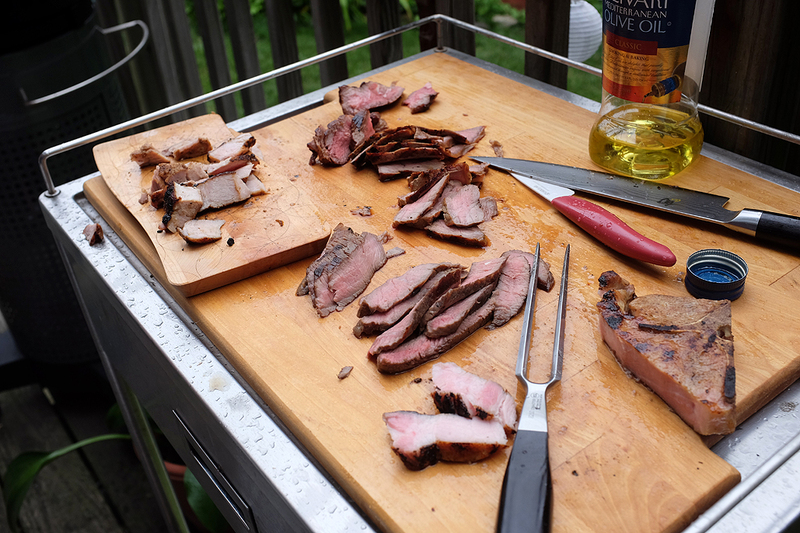 However, using a method called sous vide, we think everyone can do it every time. A bold statement? For sure, but we have some excellent reasons for our unbridled optimism. 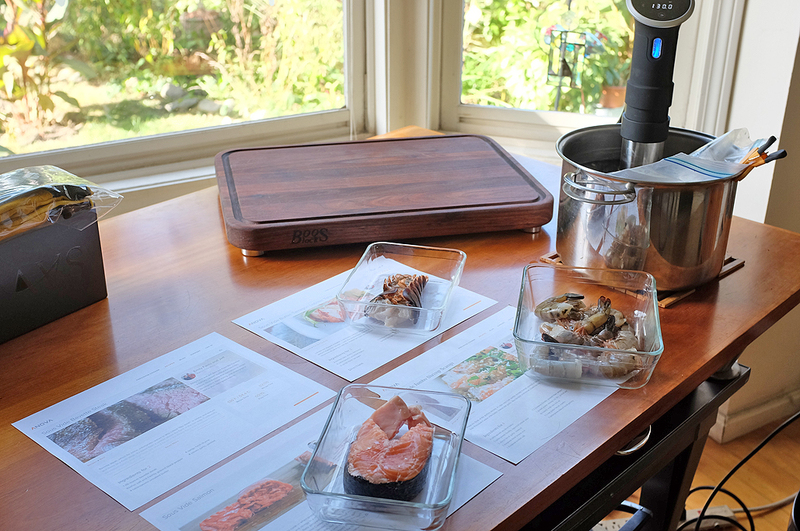 We did some research on what sous vide cooking equipment was available for the consumer market, picked a few which looked interesting (Anova, Sansaire), and over the course of the past few months used them to cook a variety of foods. We had many delicious meals in the process, learned a lot about cooking sous vide style, and did not overcook anything, not even once! 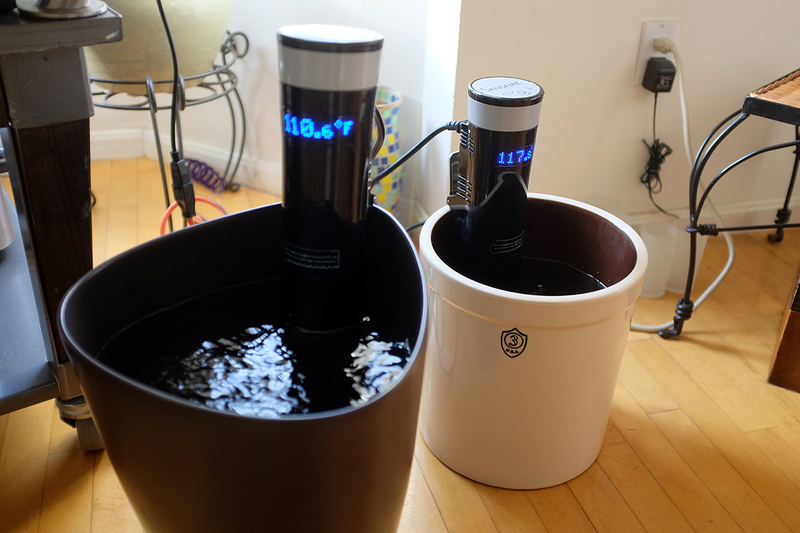 Both the Anova and Sansaire machines were easy to setup, heated the water quickly, and worked reliably. We found that the Anova cooker, with it slimmer profile, was easier to use with smaller pots. The Sansaire, with its large clip, was easier to position on our larger clay containers. The one minor difference between the two is that the Sansaire had an On/Off power switch where the Anova does not. The Anova’s temperature sensor is powered-on and its display lights up as soon as it is plugged in, although its heater and impeller are still off. While the machines are extremely precise in setting the water temperature and cooking times, the actual temperature and time does not really need to be that precise. 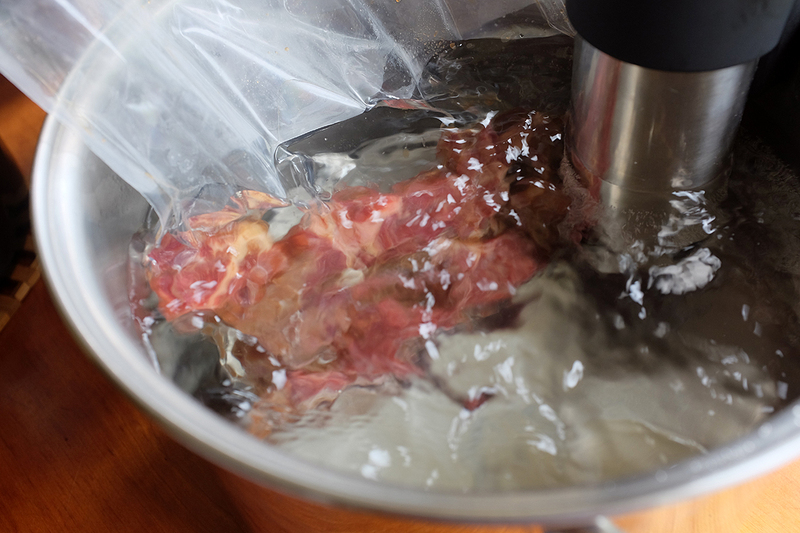 Cooking sous vide-style can make tougher cuts of beef amazingly juicy and tender. 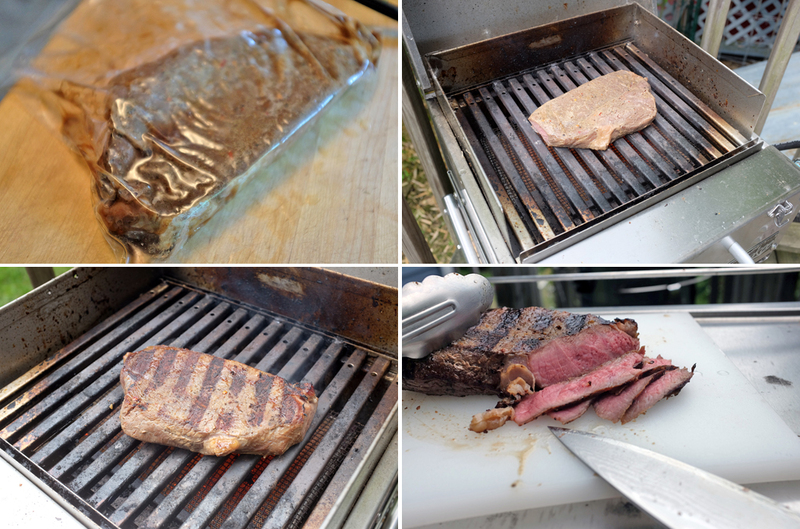 Sous vide-ing for two hours and then grilling the steak for sixty seconds is actually a time-saver. 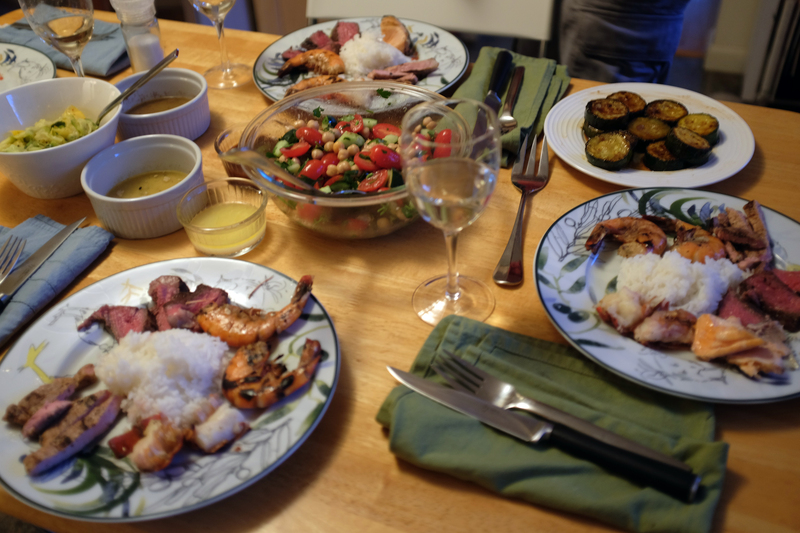 Cooking sous vide style is incredible for seafood, especially shrimp and lobster. Vegetables cooked sous vide style were OK, but in our hands, nothing to write home about. Everything seems to need only about 30 seconds of grilling on each side to finish. When cooking sous vide style, the items to be cooked must be packaged in a way which allows maximum contact with the heat from the water. Plastic freezer bags are perfect for this application. They are inexpensive, large, durable, and many have double zip-locks to ensure a waterproof seal. While we didn’t reuse any of the plastic bags, they probably could have been washed out for a few more rounds of cooking. Cooking beef at 130ºF-135ºF for two hours gave a perfect medium rare. Stew beef can be turned into melt-in-your-mouth steak tips. Cooking pork at 140ºF-145ºF for an hour was perfect for chops. An infrared grill with its high heat is perfect for “finishing” the meats. We have had the most success with London Broil, steak tips, and bone-in pork chops. We will post recipes once we have done them a few more times to make sure our results are repeatable. Containers which can hold a lot of water worked better as the water temperature, once reached, was easier to maintain. Ceramic flower pots and pickling containers with straight sides worked really well. Putting the containers on the floor is easier all around. 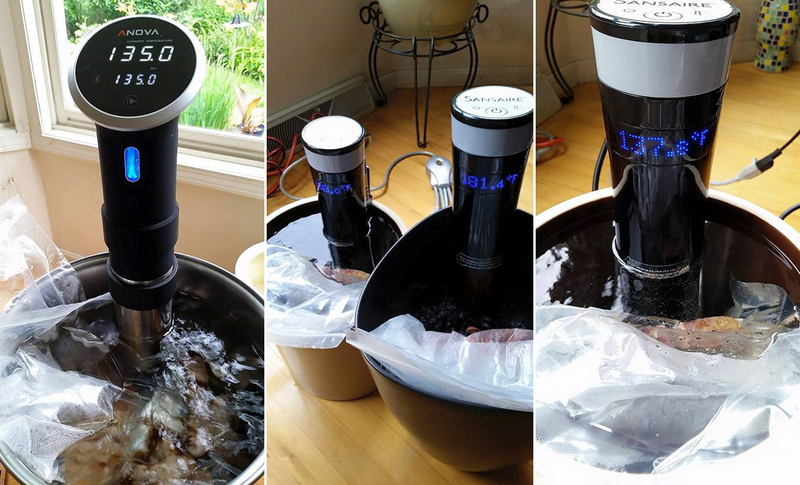 As we said previously, cooking sous vide-style can save time in the kitchen. By that we mean that once the items have been “bagged and in the bath,” we no longer had to stand and keep watch (or even think about them). While the overall cooking time may be two hours, we only had to be there at the end for the 60 seconds of grilling or pan-frying. Moreover, overcooking one item because you’re cooking two disparate items an issue with sous vide, because it’s much easier to coordinate the grilling of both steak and seafood so that they’re ready at the same time. In summary, both the Anova and Sansaire sous vide immersion cookers performed exceedingly well. They were easy to setup, program, and operate. Cleanup was just “wipe and store.” Readers wanting to give this style of cooking a try should definitely give it a go. It will not only change the way you cook, but how your meal will taste! It is THAT amazing.